A PAN type design for high performance shielded chamber, a Total Steel Structure (TSS), an improved design over conventional sandwich type wood core structure (WCS). Not affected by water and moisture. Superior Attenuation with less weight. Cutting and bending by Laser / CNC machines. Easy expandability and relocation using less parts. Radiography quality TIG welding of corners of panels. 100% testing of welding by Radiography Testing Method. TSS is very desirable in geographic regions with seismic problems. Unique Flat Surface Inside/Outside: The walls and the roof construction by flat surface inside and the floor were constructed by flat outside, which is the most ideal. SE tested as per either of IEEE Std, 299 MIL Std 285 or EN 50147-1. Doors are designed to open approx.180 degree. Rail Road gasket used between the door frame and the basic Pan structure. Door leaf hanging on the frame by the two hinges mounted in the door frame. Three rows of Copper Beryllium fingers in two pockets were provided for ensuring Shielding effectiveness. 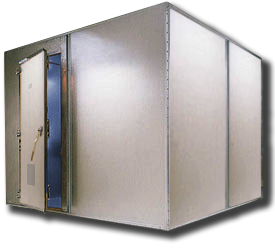 Ranging from single leaf to big sliding door to accommodate even EMI/EMC testing of air craft. Air vents generally designed with cut-off wave guide characteristics of honey- comb structure. Providing access to outer and inner signal, connectors with matched terminations on both ends. Pipe-in-pipe, electrolytic type maintenance free earthing, Shielded structure, isolation transformers are connected to earth pits. Sophisticated electronic equipment manufacturing test, calibration & repair rooms. Areas of high security, such as government or commercial communication centers. 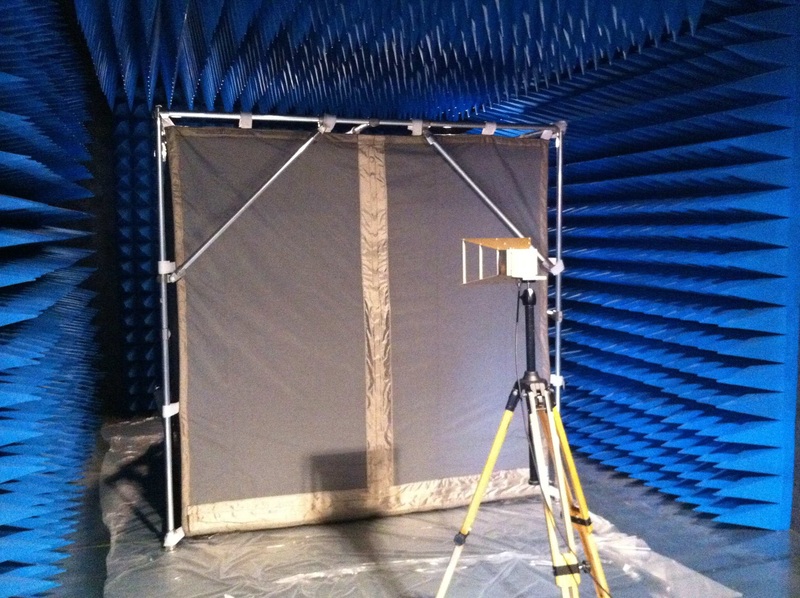 A total low cost solution of Shielded Anechoic Chamber for antenna measurements and RCS measurement. TSS offers years of maintenance free, high RF attenuation. P.U. Foam based pyramidal/wedge/walk –on/corner absorbers as required. Access Panel: Providing access to outer and inner signal. Consists of various RF connectors with matched terminations on both ends. Provided power line filter one phase, 2 lines, 15 Amperes, 220V. Frequency Range: 800MHz – 18GHz and beyond. Shielding Effectiveness (SE): Min.-80 dB on walls and -80 dB on windows or door. SE tested as per IEEE STD, 299. Quiet-Zone size: 0.5m X 0.5m Cross section. Length of quiet zone can be customized. Quietness Level: Min -30 dB at 800MHz raising to -40 dB at 3.0 GHz and higher frequencies. P.U. Foam based absorber tested as per IEEE STD. 1128. All Absorbers to be used are Fire Retarded: Passes NRL-8093, USA test 1, 2 & 3 With Zero Halogen Means. 2mm thick hot galvanized sheets used for PAN manufacturing. Joining of PANs using Rail Road wire mesh based metallic Gasket. Windows are designed to open approx.180°. Rail Road gasket used between the window frame and the basic Pan structure. Two rows of Copper Beryllium fingers are provided for ensuring Shielding Effectiveness. For various RF and Microwave Measurements under controlled conditions. Advanced Antenna positioner with turntable capable of 360 degree azimuth rotation with 1 degree step precisely controlled by PC software. Antenna positioner can be synchronized with various analyzers like VNA, Power Meter etc. to record power reading automatically at various positions. PC interface software to operate positioner & to draw polar plots. Low RCS stands for both transmitting & receiving antennas mounting. Various RF cables & connectors to be used inside chamber. 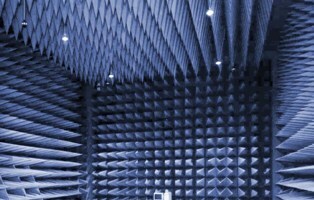 Low cost solution to anechoic chamber. Set consists of two boxes, one for Transmitter (Tx) and other Receiver(Rx) for AUT/DUT. Five side absorber covered metallic movable plate. Optimum performing absorbers at near normal/grazing incidences of extraneous signals used. Necessary requirement for accurate antenna measurements & RCS measurements. Each box of 1.2m X 1.2m X 1.2m size. Test zone size where Antenna Under Test (AUT) to be placed is 0.2mX0.2mX0.2m in receiving box. Reflection signal (reaching test zone) down by min -30dB with respect to direct signal at 800 MHz raising up to -40dB at 3.0 GHz and higher frequencies. All Absorbers to be used are Fire Retardant per Passes NRL-8093, test 1, 2 & 3 With Zero Halogen Means. With turntable capable of 360 degree azimuth rotation with 1 degree step precisely controlled by PC software. The frame is in Alluminum 6082 tube diam. 34mm thick 4,5mm. The joints are type 6-1″ diam. 33,7mm. The weight of the dimension 8x5 h.3,5 mt is 296 Kg.